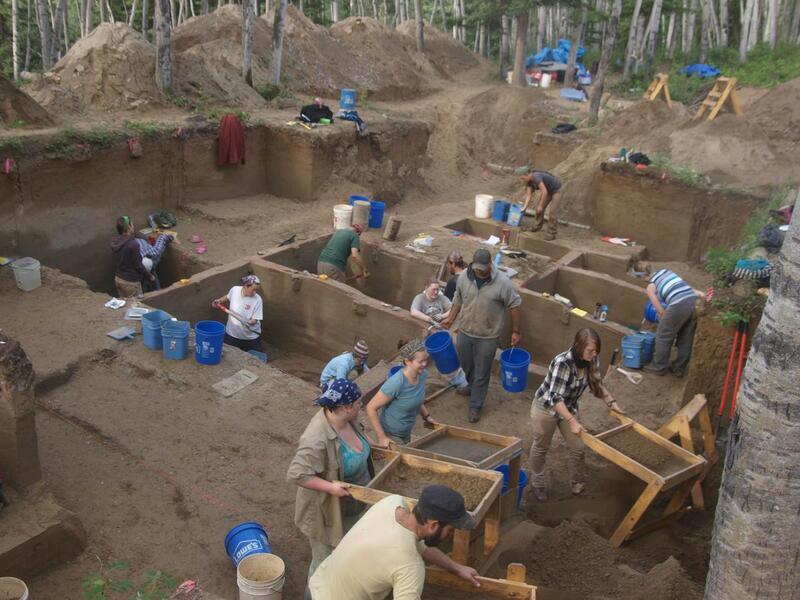 University of Utah scientists deciphered maternal genetic material from two babies buried together at an Alaskan campsite 11,500 years ago. 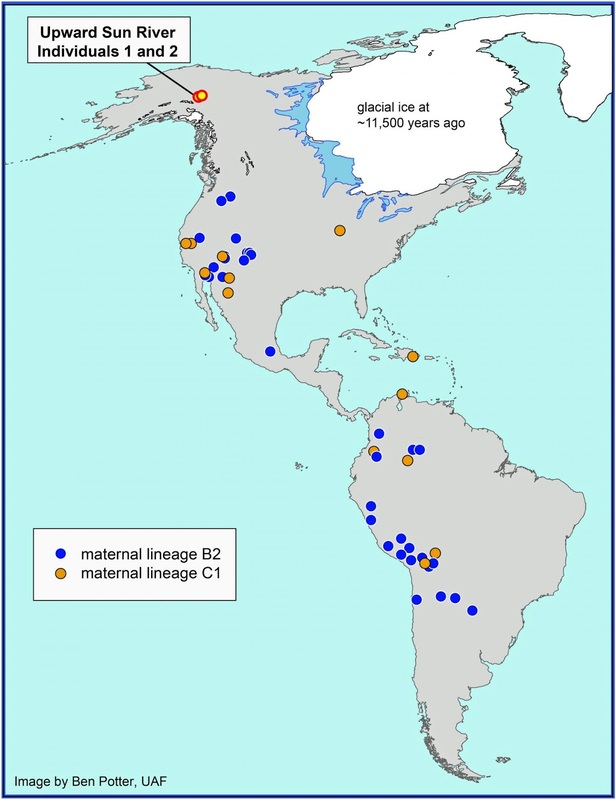 They found the infants had different mothers and were the northernmost known kin to two lineages of Native Americans found farther south throughout North and South America. By showing that both genetic lineages lived so far north so long ago, the study supports the "Beringian standstill model." It says that Native Americans descended from people who migrated from Asia to Beringia - the vast Bering land bridge that once linked Siberia and Alaska - and then spent up to 10,000 years in Beringia before moving rapidly into the Americas beginning at least 15,000 years ago. This map shows the location of the Upward Sun River site in Alaska where the remains of two infants, Upward Sun River individuals 1 and 2, were found in an 11,500-year-old burial. A new University of Utah analysis shows the infants belong to two genetic groups or lineages known as B2 and C1. The maps shows other Native American groups throughout the Americas that are part of the same lineages. "These infants are the earliest human remains in northern North America, and they carry distinctly Native American lineages," says University of Utah anthropology professor Dennis O'Rourke, senior author of the paper set for online publication the week of Oct. 26 in the journal Proceedings of the National Academy of Sciences. "We see diversity that is not present in modern Native American populations of the north and we see it at a fairly early date. This is evidence there was substantial genetic variation in the Beringian population before any of them moved south." Another theory was that the two Native Americans lineages evolved as the people moved south and dispersed, not while they still were in Beringia, says Justin Tackney, the new study's first author and a University of Utah anthropology doctoral student. But finding those lineages in the infants only a few thousand years after the migration south began indicates those lineages already were present before the migration started. "It supports the Beringian standstill theory in that if they [the infants] represent a population that descended from the earlier Beringian population, it helps confirm the extent of genetic diversity in that source population," O'Rourke says. "You don't see any of these lineages that are distinctly Native American in Asia, even Siberia, so there had to be a period of isolation for these distinctive Native American lineages to have evolved away from their Asian ancestors. We believe that was in Beringia." The burial of ancient infants is rare. One was a 6- to 12-week-old baby; the other a stillborn or preterm 30-week fetus. The discovery of the infant burials first was reported in the same journal this past November. They are among human remains at only eight sites in North America older than 8,000 years and from which researchers obtained mitochondrial DNA - genetic information inherited only from mothers. The infants are the northernmost of all those remains and of the two lineages they represent. In the eight sites, "we find all five of the major lineages of Native Americans," Tackney says. "That indicates that all were present in the early population in Beringia that gave rise to all modern Native Americans." The Upward Sun River ancient campsite was discovered in 2006 in the Tanana River valley about 50 miles southeast of Fairbanks. The area once was part of Beringia. The land bridge between Asia and Alaska existed when sea levels were low during the last Ice Age from 28,000 years ago to at least 18,000 years ago. In 2010, a team led by University of Alaska Fairbanks anthropologist Ben Potter discovered the remains of a cremated 3-year-old child buried near the hearth of a residential structure. The child's DNA couldn't be recovered from the charred remains. In 2013, Potter's team found the remains of two more buried infants beneath the first. They had't been cremated. Potter says it's hard to tell how the infants died. Potter, who co-authored the new study, asked O'Rourke to analyze their mitochondrial DNA. O'Rourke and Tackney worked with University of Utah geneticists to sequence the mitochondrial DNA of the two infants - known as USR1 and USR2 for Upward Sun River. Mitochondrial DNA is located in mitochondria, or the power plants of cells. From fragments of skull bone, the researchers read 58.7 million DNA sequences from USR1 and 55.8 million from USR2. From those, the Utah scientists obtained 20,004 high-quality mitochondrial DNA sequences for USR1 and 32,979 for USR2. "We were able to obtain the entire mitochondrial genome [genetic blueprint] sequence for each of them, as opposed to just a partial sequence," O'Rourke says. Potter says the new findings help in "understanding the genetic diversity among very early Beringian populations that connects them in many ways to Native Americans in both North and South America." "It's not common to find infants buried together that are not related maternally," O'Rourke says. "It raises questions about the social structure and mortuary practices of these early people," including whether the babies had a common father. Lineage C1 (most remains aren't identified to the subgroup C1b level) is found most often among the Pima and Hualapai Indians of Arizona, the Delta Yuman of California, and six other tribes, including the Ignaciano in Bolivia, the extinct Tainos in Puerto Rico and a group represented by 700-year-old bones at Norris Farms in Illinois. Lineage B2 is found most often in 37 tribes throughout the Americas, including the Yakama, Wishram, Northern Paiute-Shoshoni, Navajo, Hualapai (which also carries C1 genes), Zuni and Jemez in North America and the Quecha and Aymara in Peru. The B2 lineage also was common among the U.S. Southwest's ancient Fremont and Anasazi. The genetic data indicate that the most recent common ancestor of the C1b lineage existed at least 12,854 years ago, and the most recent common ancestor of the B2 lineage existed at least 12,024 years ago. O'Rourke suspects the real times were even earlier, but that nonetheless both 11,500-year-old infants were at or near the root of their respective genealogical trees. "It may well be that the population represented by Upward Sun River is indicative of many such isolated populations distributed across Beringia, each of which may have contributed migrants to that early American Indian dispersal, and each may have been slightly genetically different from the others," O'Rourke says. This is the Upward Sun River archaeological site in Alaska. Modern tribal populations in northern North America show little mitochondrial DNA diversity, O'Rourke says. Why did lineages that once occupied the subarctic vanish there but show elsewhere in the Americas? And why aren't the five major lineages spread evenly across the Americas? "The reason is changes in population size and rates of population migration," O'Rourke says. "In small populations, some lineages just get lost and don't get passed on, and in others they become established and more common." "Studying the DNA of ancient individuals is important in researching how the Western Hemisphere was populated," Tackney says. "Studying the genetics of these infants who died 11,500 years ago in what is now central Alaska helps answer questions of who these people were and how they are related to modern native populations." A team of astronomers is proposing that huge spiral patterns seen around some newborn stars, merely a few million years old (about one percent our sun's age), may be evidence for the presence of giant unseen planets. This idea not only opens the door to a new method of planet detection, but also could offer a look into the early formative years of planet birth. A computer model reproduces the two-spiral-arm structure; the "x" is the location of a putative planet. The planet, which cannot be seen directly, probably excites the two spiral arms. "It's difficult to see suspected planets inside a bright disk surrounding a young star. Based on this study, we are convinced that planets can gravitationally excite structures in the disk. 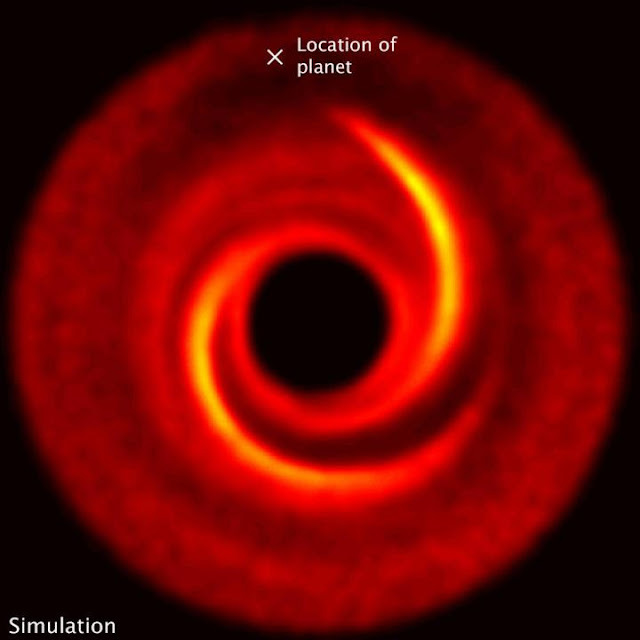 So if you can identify features in a disk and convince yourself those features are created by an underlying planet that you cannot see, this would be a smoking gun of forming planets," Dong said. Identifying large-scale features produced by planets offers another method of planet detection that is quite different from all other techniques presently used. This approach can help astronomers find currently-forming planets, and address when, how, and where planets form. Gaps and rings seen in other circumstellar disks suggest invisible planets embedded in the disk. However gaps, presumably swept clean by a planet's gravity, often do not help show location of the planet. Also, because multiple planets together may open a single common gap, it's very challenging to estimate their number and masses. Observations taken by the European Southern Observatory's Very Large Telescope show a protoplanetary disk around the young star MWC 758. The disk has two spiral arms that extend over 10 billion miles from the star. Ground-based telescopes have photographed two large-scale spiral arms around two young stars, SAO 206462 and MWC 758. A few other nearby stars also show smaller spiral-like features. "How they are created has been a big mystery until now. Scientists had a hard time explaining these features," Dong said. If the disks were very massive, they would have enough self-gravity to become unstable and set up wave-like patterns. But the disks around SAO 206462 and MWC 758 are probably just a few percent of the central star's mass and therefore are not gravitationally unstable. The team generated computer simulations of the dynamics of a disk and how the star's radiation propagates through a disk with embedded planets. This modeling created spiral structures that very closely resemble observations. The mutual gravitational interaction between the disk and the planet creates regions where the density of gas and dust increases, like traffic backing up on a crowded expressway. The differential rotation of the disk around the star smears these over-dense regions into spiral waves. Although it had been speculated that planets can produce spiral arms, we now think we know how. "Simulations also suggest that these spiral arms have rich information about the unseen planet, revealing not only its position but also its mass," Zhu said. The simulations show that if there were no planet present, the disk would look smooth. To make the grand-scale spiral arms seen in the SAO 206462 and MWC 758 systems, the unseen planet would have to be bulky, at least 10 times the mass of Jupiter, the largest planet in our solar system. The first planet orbiting a normal star was identified in 1995. Thanks to ground-based telescopes and NASA's Kepler mission, a few thousand exoplanets have been cataloged to date. But because the planets are in mature systems, many millions or a few billion years old, they offer little direct clues as to how they formed. "There are many theories about how planets form but very little work based on direct observational evidence confirming these theories," Dong said. 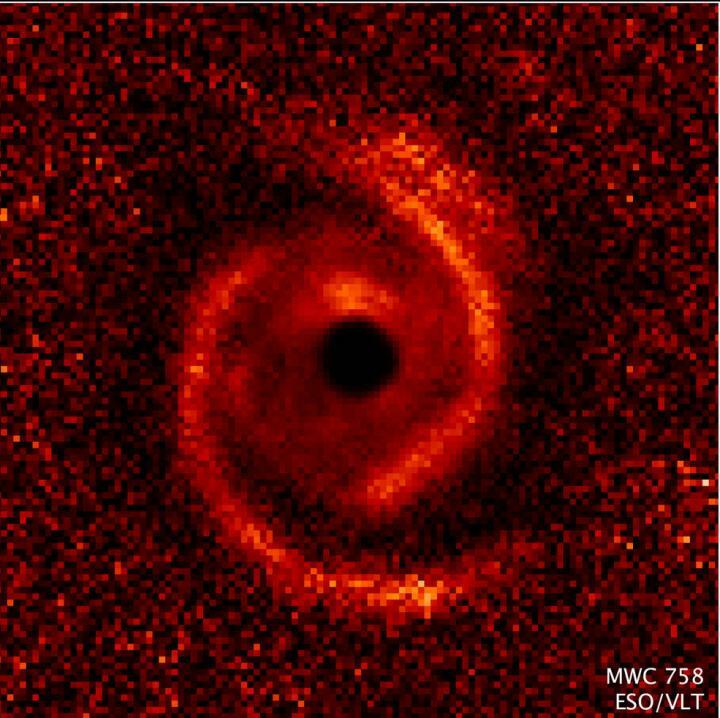 "If you see signs of a planet in a disk right now, it tells you when, where, and how planets form." Scientists have catalogued nearly 2,000 exoplanets around stars near and far. While most of these are giant and inhospitable, improved techniques and spacecraft have uncovered increasingly smaller worlds. The day may soon come when astrophysicists announce our planet's twin around a distant star. But size alone is insufficient to judge a globe. Though Earth and Venus are nearly identical in size, the latter's surface is hot enough to melt lead. Astronomers must gather information about an exoplanet's atmosphere, often through observing how the planet scatters or absorbs light from its parent star. But, that information is not always useful -- as is the case with the exoplanet GJ1214b. This is an artistic depiction of the exoplanet GJ1214b. "When an exoplanet passes in front of its star, light can be absorbed at some wavelengths by molecules in the atmosphere, which we can analyze by looking at how light passes through the planet's atmosphere," said Benjamin Charnay, a postdoctoral researcher in the University of Washington Department of Astronomy. "But for this planet, when researchers previously looked with the Hubble Space Telescope, they saw almost no variation with wavelength of light." This "flat spectrum" for GJ1214b indicated that something in the planet's upper atmosphere blocked light, keeping scientists in the dark regarding its atmosphere. Charnay decided to computationally model what its atmosphere could be, based on the planet's temperature and composition. In the process, as he reports in a new paper in Astrophysical Journal Letters, he and his collaborators became the first to simulate three-dimensional exotic clouds in the atmosphere of another world. "It's an important step in characterizing exoplanets," said Charnay. GJ1214b was among the first "mini-Neptune" exoplanets discovered, which are intermediate in size between Earth and Neptune. They're the smallest exoplanets that can be studied with existing technology, and GJ1412b is in an ideal position. "Most of the other mini-Neptunes that have been discovered orbit stars between 100 and 1,000 light years away," said Charnay. "GJ1214b is quite close to Earth, just 42 light years away, and it orbits its star in just 1.6 days." 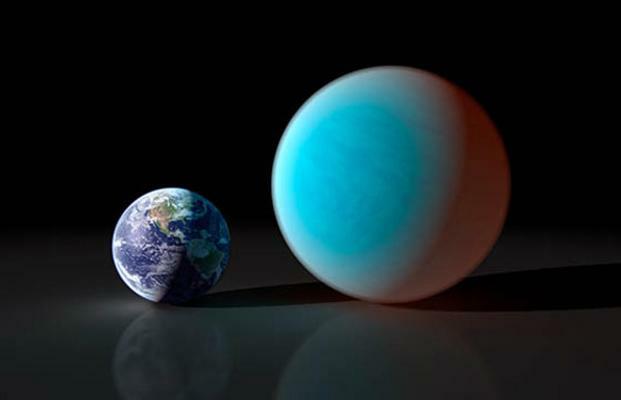 This is a size comparison of GJ1214b and Earth. That fast orbit gave scientists the opportunity to record the exoplanet's flat spectrum, ruling out an atmosphere of simple hydrogen, water, carbon dioxide or methane. Instead, something high in the atmosphere was blocking light from penetrating farther down. "There could either be high clouds in the atmosphere or an organic haze -- like we see on Titan," said Charnay. Its atmospheric temperature exceeds the boiling point of water. As a result, if GJ1214b sported clouds, they would probably be some form of salt, said Charnay. But such clouds should form deep in the atmosphere, much lower than the altitude where they are observed. Charnay modeled how the clouds could form in the lower atmosphere and then rise into the upper atmosphere with sufficient circulation. To accomplish this, Charnay, used a climate model developed by his former research group in Paris. He previously used this model for studying Titan and the early Earth, and adapted it for GJ1214b. Charnay ran his three-dimensional cloud model on the UW's Hyak supercomputer. It shows how GJ1214b could create, sustain and lift salt clouds into the upper atmosphere, where they would contribute to the planet's flat spectrum that Hubble detected. His model also makes specific predictions about the effect these clouds will have on the planet's climate and the types of information that future telescopes, like the James Webb Space Telescope, will be able to gather. 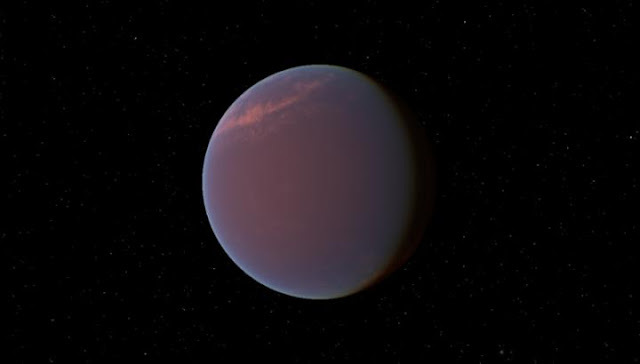 Charnay would next like to model the other potential cause of the exoplanet's flat spectrum: photochemical haze, which gives Titan its shrouded orange atmosphere and Los Angeles its persistent dome of polluted air. "Light splits chemicals in the atmosphere, creating more complex organic compounds that make the haze," said Charnay. Charnay will have to wait until the James Webb Space Telescope launches later this decade to find out which theory -- clouds or haze -- gives GJ1214b a flat spectrum. In the meantime, in addition to his quest to simulate haze on this exoplanet, Charnay would like to model what the atmosphere was like on Earth before life evolved. "Worlds like Titan and this exoplanet have complex atmospheric chemistry that might be closer to what early Earth's atmosphere was like," said Charnay. "We can learn a lot about how planetary atmospheres like ours form by looking at them." The electric eel may be one of the most remarkable predators in the entire animal kingdom. That is the conclusion of Kenneth Catania, Stevenson Professor of Biological Sciences at Vanderbilt University, who has spent the last three years studying the way this reclusive South American fish uses electric fields to navigate through the muddy waters of the Amazon and Orinoco basins where it lives, locate hidden prey and stun them into submission. Electric eel (Electrophorus electricus) is pictured. 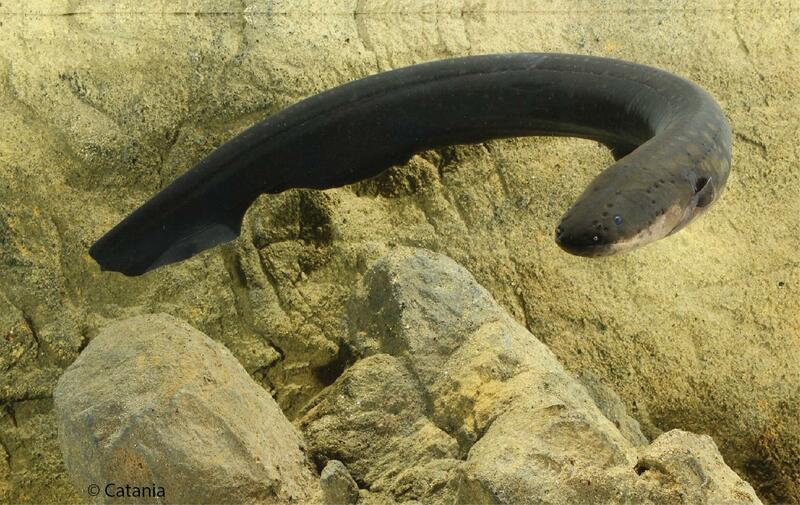 Electric eels can grow to lengths exceeding eight feet and weights of more than 44 pounds. Over two thirds of the eel's body is filled with specialized cells called electrocytes that store electricity like small biological batteries. When the eel is threatened or attacking prey, these cells discharge simultaneously, emitting electrical discharges of at least 600 volts, five times the voltage of a standard U.S. wall socket. "Historically, electric eels have been viewed as unsophisticated, primitive creatures that have a single play in their playbook: shocking their prey to death," said Catania. "But it turns out that they can manipulate their electric fields in an intricate fashion that gives them a number of remarkable abilities." One of the biologist's latest discoveries, reported in the Oct. 29 issue of the journal Current Biology, is that the eels have a special maneuver that allows them to double the electrical shock that they can deliver to particularly large or difficult prey. This movie shows how the electric eel uses a curling maneuver to concentrate its electric field on its prey. The eel's electrical system essentially provides it with a wireless Taser that it uses to stun its prey. In a study published last year, Catania reported that the eels produce three different kinds of electrical discharges: low-voltage pulses for sensing their environment; short sequences of two or three millisecond, high-voltage pulses given off while hunting; and volleys of high-voltage, high-frequency pulses when the eel is capturing prey or defending itself. In a series of experiments he showed that the electrical pulses the eel produces do not act on the muscles themselves but on the nerves that control the prey's muscles. This produces strong, involuntary muscle contractions. What particularly fascinates the biologist is that the eel's electrical system gives it what is essentially remote control over its prey's muscles. "I don't know of any other animal that can literally take control of the body of another animal like this," said Catania. Normally, the eel subdues smaller feeder fish by swimming into their vicinity and then blasting them with a volley of Taser-like pulses. This causes whole-body muscle contractions, temporarily paralyzing the prey. If, for some reason, the eel doesn't immediately grab the fish in its mouth, its victim will usually recover and swim away without any apparent damage. An eel's head with electroreceptors is highlighted in red and water movement receptors are highlighted in green. More recently Catania discovered that the eel had a second attack mode when it realized it was facing bigger, more difficult prey like large crayfish. In this case, the eel begins by biting its prey. Then it curls its tail around the body of its prey until the tail lies directly across the body from the eel's head. Then the eel greatly increases the rate of its high-voltage electrical pulses. This behavior had been observed before, but no one had offered an explanation. Catania realized that the maneuver brings the positive pole of the eel's electric organ, which is located in its head, in close to proximity to its negative pole, located in its tail. By bring the two poles close together, with the prey sandwiched in between, the eel increases the amount electric charge that it delivers to its victim, he realized. So he designed some experiments to measure this effect and found that it more than doubled the strength of the electrical pulses that the prey received. Like the Taser-like pulses, the strengthened discharges act on the nerves that control the prey animal's muscles. But Catania's studies found that the increased power and high pulse rate had an additional effect: It drives the prey muscles so fast and hard that they suffer from profound muscle fatigue. "The prey animals are completely paralyzed," said Catania. "The effect is comparable to administering a dose of a paralytic agent like curare." Another example of how the eel benefits from this remote control capability is its use of doublets and triplets - short sequences of two or three millisecond, high-voltage pulses that the eels give off while hunting. It took Catania an extended period of investigation and observation to figure out the purpose of these signals. He finally realized that the pulses were being produced at precise frequencies that induce whole body muscle spasms. "One of the eel's major problems is finding prey in the first place," said Catania. "Their environment in the Amazon is filled with muddy water and all kinds of vegetation that give fish a lot of places to hide. So, as the eel glides along, it emits a doublet or triplet. If there is a fish hiding nearby, then its body will spasm and the spasm will generate pressure waves in the water. Although the electric eels can't see very well, they are very good at detecting water movement. So this reveals the position of its next meal." Catania has also discovered that the eel uses its high-voltage electric discharges as a high-precision radar system that allows it to track fast-moving prey. 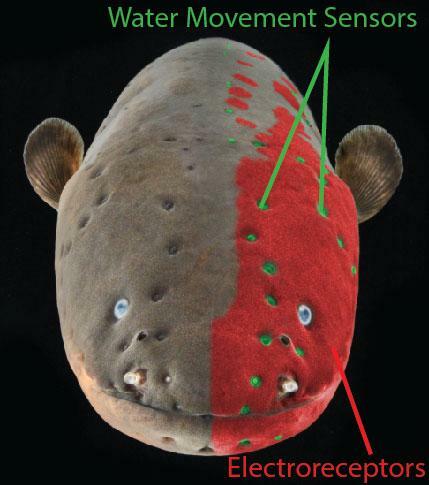 For some time, biologists have known that electric fish, in general, and electric eels, in particular, use a low-voltage electric field for navigation. In an article published online by Nature Communications on Oct. 20, Catania reported that the electric eel has a secondary use for its high-voltage electrical system: to track fast-moving prey. The eel needs a way to keep track of the location of its prey after it is stunned. By designing a series of experiments that preventing the eels from using other sensory cues, Catania showed that the eels used feedback from their high-voltage volleys to zero in on the position of their prey. "This dual use of the high-voltage system as both a weapon and a sensory system indicates that the eels' hunting behavior is far more sophisticated than we have thought," said Catania. Living hominoids are a group of primates that includes the small-bodied apes (the lesser apes, or gibbons and siamangs, which constitute the family Hylobatidae) and the larger-bodied great apes (orangutans, gorillas and chimpanzees), which, along with humans, belong to the family Hominidae. All extant hominoids share several features, such as the lack of external tail, an orthograde body plan that enables an upright trunk position, and several cranial characteristics. All these features might have been present in the common ancestor of hominids and hylobatids that, according to molecular data, would have lived about 15-20 million years ago. 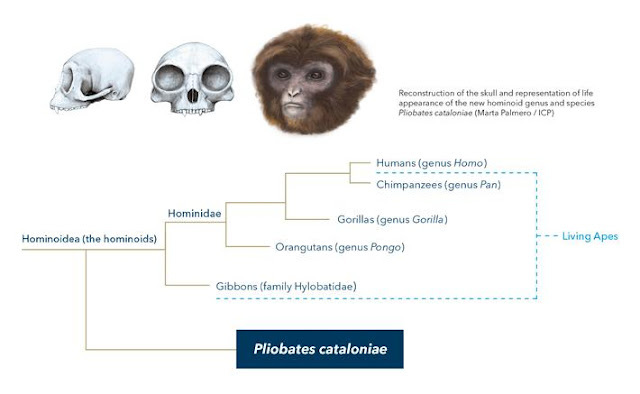 Pliobates cataloniae is a new primate species at the root of the tree of extant hominoids. Includes statements of David M. Alba, Head of the Neogene and Quaternary Faunas Research Group at Institut Català de Paleontologia Miquel Crusafont (ICP) discusses the research. Researchers from the 'Institut Català de Paleontologia Miquel Crusafont' (ICP) have described the new genus and species of extinct hominoid, Pliobates cataloniae, based on a partial skeleton composed of 70 fossil remains found in 2011 in one of the sites within the stratigraphic series of Abocador de Can Mata (els Hostalets de Pierola, Barcelona, Catalonia, NE Iberian Peninsula). These include most of the skull and dentition as well as a considerable portion of the left arm, including several elements of the elbow and wrist joints. They belong to an ape similar in size to the smallest of living gibbons (4 to 5 kg), which lived 11.6 million years ago. Pliobates shows, for the first time in a primate fossil of this size, a set of characteristic features of extant hominoids, presumably inherited from their last common ancestor, which probably lived in Africa several million years before Pliobates. This find radically changes the hitherto accepted morphotype of the hylobatid-hominid ancestor and provides very solid clues about the origin of extant gibbons. "The origin of gibbons is a mystery because of the lack of fossil record, but until now most scientists thought that their last common ancestor with hominids must have been large, because all of the undoubted fossil hominoids found so far were large-bodied", explains David M. Alba, the ICP researcher leading the study published in the journal Science. All the small-bodied (5 to 15 kg) fossil anthropoids found before Pliobates displayed a body plan too primitive to be closely related to extant hominoids. "This find overturns everything", according to this ICP researcher. Reconstruction of the skull (front and side view) and representation of life appearance ofPliobates cataloniae are shown. Pliobates retains some primitive characteristics. However, its arm anatomy, specifically the wrist bones and the joint between the humerus and radius, already possesses the basic design of living hominoids. A phylogenetic analysis, based on more than 300 characters, very consistently places Pliobates as the stem hominoid closest to the divergence between lesser and great apes (hylobatids and hominids, respectively), and suggests that the last common ancestor of extant hominoids might have been more similar to living gibbons than to the extant great apes than previously thought. In fact, the skull and some parts of the postcranial skeleton of Pliobates cataloniae show some features that are exclusive to extant gibbons. "This suggests that, alternately, Pliobates might be the sister group of extant gibbons only", asserts Salvador Moyà-Solà, ICREA researcher and director of the ICP, who also participated in the study. "We hope that future discoveries in the landfill of Can Mata will help us to clarify the role played by small-bodied catarrhines in hominoid evolution and, finally, to solve the enigma of extant gibbons' origins", concludes Moyà-Solà. This is the main cranial fragment of Pliobates cataloniae in basal view. The adaptations of the postcranial skeleton of Pliobates cataloniae are indicative of a locomotor repertoire mostly consisting in slow and cautious climbing through the canopy, with a great flexibility of movement and some capacity of below-branch suspension. Its encephalization degree was similar to that of living monkeys and gibbons, but lower than that of living great apes. Microscopic marks left by food items on the occlusal surfaces of its teeth shortly before death indicate an essentially frugivorous diet (i.e., based mainly on ripe and soft fruit), like in living gibbons. The cranial remains were so fragmentary that researchers relied on a virtual reconstruction based on high-resolution computed-tomography imagery to study them. The name of the new genus (Pliobates) is a combination of Pliopithecus (which means "more ape") and Hylobates ("the one who walks or haunts"), in allusion to the primitive similarities with other previously-known small-bodied anthropoids (pliopithecoids) and the resemblances, in derived features, with extant gibbons (hylobatids). The species epithet (cataloniae) is a geographical reference the location of the site in Catalonia. The specimen has been nicknamed "Laia", a familiar diminutive of "Eulalia", the patron of Barcelona, which literally means "well spoken, eloquent" because of the new knowledge that means to science. The finding of Pliobates proves once again that the complex of sites at Abocador de Can Mata is one of the most important places worldwide to study the origin of extant hominoids. The paleontological surveillance performed during the enlargement of the landfill over the last 13 years, under the scientific supervision of the ICP, has enabled the recovery of extraordinary fossil primate remains from 12.5 to 11.5 million years ago. Most noteworthy are the skeleton of Pierolapithecus catalaunicus (known as "Pau"), found in 2002 and described in 2004, as well as the skull of Anoiapithecus brevirostris ("Lluc"), described in 2009. During the middle and early late Miocene, the area where the current landfill is located was a closed forest with a warm and wet climate with some permanent waterbodies nearby. This environment facilitated a great faunal diversity, as it is represented by the nearly 80 mammalian species that have been identified at the site, in addition to several amphibians, reptiles and birds. Thus, besides hominoid and pliopithecoid primates, small mammals (insectivores and rodents), ungulates (such as horses, rhinos and deer), many carnivorans (including those known as "false saber-toothed cats", currently extinct), and proboscideans distantly related to modern elephants have been found in this area. Most of what we know about Mayan civilization relates to kings, queens and their elaborate temples. To understand what life was like for the 99 percent, one researcher turned to ancient animal bones stored at the Florida Museum of Natural History. Ashley Sharpe, a doctoral student at the museum on the University of Florida (UF) campus, says the picture researchers have painted of the Maya people isn't broad enough. "When you think about the Romans and the Greeks, we know a lot about all of the different social classes -- from the Caesars down to the commoners -- but although there were tens of thousands of middle-class and lower-income Maya in big cities, we still don't know much about the everyday lives of most people." For the first time in Maya archaeology research, 22,000 animal remains at the museum, one of the largest collections of its kind outside of Central America, were used as clues about life in the Maya lower classes. The bones revealed that the civilization known for its art and astronomy also had political and economic systems that were more complex than previously thought - systems similar to modern societies. The details are described in a new study appearing online this month in the Journal of Anthropological Archaeology. This cut jawbone and teeth of a tapir, a pig-like mammal that inhabits the Maya region, show carvings called ‘rasps’ made by an ancient Mayan. Researchers think these bones were used as musical instruments by rubbing a stick over the surface. "We looked at how the Maya acquired and distributed animal resources in order to learn more about the economy and how the royal, elite and lower classes interacted," said Sharpe, who has either lived in or made frequent trips to the Maya region since 2008. "It turns out, the Maya states and classes were not all homogenous. They had complicated systems in place for trade relations, distribution of food and access to species, which varied among the cities and social classes much like they do today." Sharpe and co-author Kitty Emery, Florida Museum associate curator of environmental archaeology, examined the animal remains recovered from the ruins of three Maya city-states in Guatemala, including the famous site of Aguateca that was burned after a surprise enemy attack which resulted in a level of preservation similar to the Roman ruins of Pompeii. Sharpe traced the movement of animals and their resources from trade partners to Aguateca and the capitals of Piedras Negras and Yaxchilan. She also followed the flow of resources between royalty, the rich and the poor at the capital cities and to the less powerful surrounding villages. "The Maya used animals for things like hides, tools, jewelry and musical instruments, but they were also vitally important as emblems of status, royalty and the symbolic world of the gods, and thus often were prime resources jealously guarded by the rich and powerful," Emery said. Surprisingly, however, study researchers found that middle-ranking elites used the widest variety of animals. Royalty and other high-ranking elites focused on a select group of symbolic and prestigious animals like jaguars and crocodiles, Sharpe said. "We had expected that the elites would have the highest diversity but that was not the case," she said. "The elites ate animals that were considered delicacies, sort of the way people in our own upper class eat things like caviar, but the rest of us think it's kind of gross." Sharpe said poor villagers mostly ate fish and shellfish from rivers near their homes. However, both the poor and middle-elite classes living at the capitals kept a wider variety of animals for themselves than they shared with the surrounding villages, particularly more species from deep inside forests and from the ocean, which was 50 to 100 miles away. At Aguateca, more than 100 miles from the nearest coast, thousands of marine shells were found covering the floors of ancient households and craft workshops. "These people didn't have pack animals like in the Old World where they had horses and donkeys to carry goods," Sharpe said. "They were literally carrying things on their backs from the sea. They did have rivers to help with transportation, but not a lot of rivers, and on land they also had the jungle to contend with." At Yaxchilan, more than half of the skeletons found were deer, suggesting residents primarily relied on nearby forests, including the deer that fed on their corn fields. However, much like in medieval Britain, there is evidence the Maya may have regulated hunting and fishing, creating more of a divide in access to animal resources among the classes, Sharpe said. At each of the three cities, elites, middle and lower classes all had access to different types of species, both imported marine resources as well as animals that could be obtained from nearby forests and rivers, she said. The differences in predominate species, such as marine animals and deer, show the city-states likely had different trade partners, which Sharpe said makes sense because we know there were, at times, hostilities between the cities. The differences could also point to unique cultural identities, she said. For example, the residents of Aguateca were known for their jewelry made from shells. "This is the first time we're seeing this sort of evidence for what the middle and lower classes were doing," Sharpe said. Archaeologists have been working amid dense jungle to understand how the many Maya city-states functioned since the early 20th century. They have raised questions about how states cooperated, or didn't, with one another, how much control and interaction state capitals had with their subordinate villages, and how the various social classes differed, Sharpe said. Sharpe and Emery decided to analyze animal bones to begin answering these questions because animal resources played such a vital role in the politics and economy of the Late Classic Maya civilization (A.D. 500-900), Emery said. But buried beneath the jungle floor in Guatemala are enough mysteries to fill Sharpe's entire career. "It almost doesn't matter where you dig in the jungle near these centers, you hit paved limestone floor. It gives you the sense that at one time, the entire place was deforested and it was a massive city," she said. "When you travel to these capitals, you drive over unexcavated mounds that were once people's houses -- people we know little or nothing about." A team of researchers from the George Washington University (GW) and the Institut Català de Paleontologia Miquel Crusafont (ICP) identified a new genus and species of small ape that existed before the evolutionary split of humans/great apes (hominids) and gibbons (the 'lesser apes' or hylobatids). Named Pliobates cataloniae, the new species has important implications for reconstructing the last common ancestor of the two groups (the living hominoids). The findings were published Thursday in Science magazine. 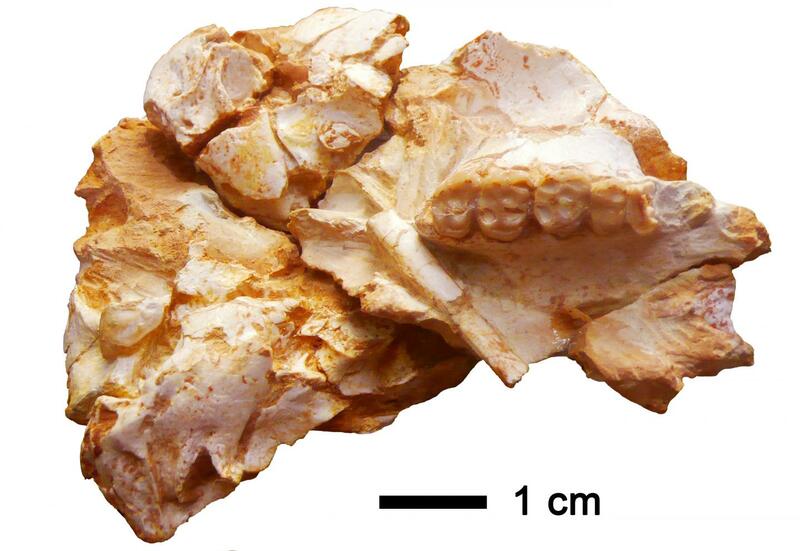 "This fossil discovery is providing a missing chapter to the beginning of ape and human history," said Sergio Almécija, assistant professor of anthropology in the Center for the Advanced Study of Human Paleobiology at GW's Columbian College of Arts and Sciences. "We used to think that small apes evolved from larger-bodied apes, but this new species tells us that small and large apes may have co-existed since hominoids originated. Alternatively, Pliobates might indicate that great apes evolved from gibbon-size ape ancestors." A team of researchers from the George Washington University and the Institut Català de Paleontologia Miquel Crusafont identified a new genus and species of small ape that existed before the evolutionary split of humans/great apes (hominids) and gibbons (the 'lesser apes' or hylobatids). The discovery fills a gap in the fossil record, giving researchers another piece of information about the evolution of great and small apes. Anthropologists previously thought that great apes were present before small apes, mainly due to the lack of small apes and ancient gibbons in the fossil record. Pliobates has forced them to consider the role that small apes played in hominoid evolution. "These remains clearly belong to an ape, but they are so small," Dr. Almécija said. "Then we realized, maybe we are looking at this the wrong way. Maybe some early ape ancestors were smaller than we thought." 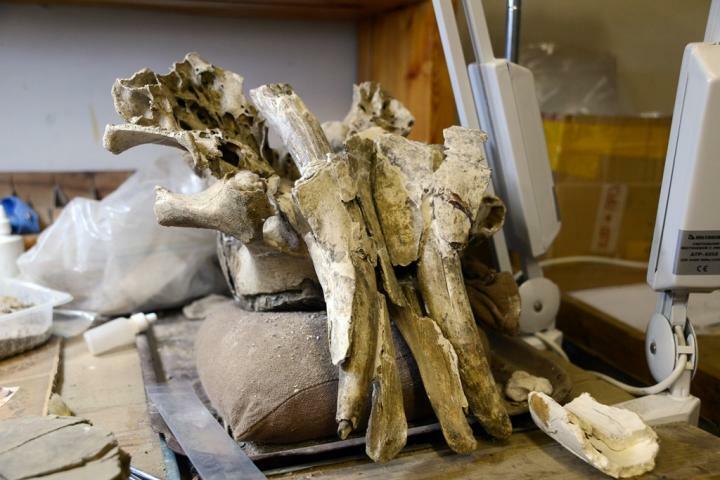 The partial skeleton that led to the announcement was discovered during the construction of a landfill in Barcelona, Abocador de Can Mata, in 2011 and was composed of 70 fossil remains. Scientists concluded the fossil remains belong to an adult female that weighed between 9 and 11 pounds, consumed soft fruits and moved through the forest canopy by climbing and suspending below branches. Pliobates cataloniae lived 11.6 million years ago. At the end of the Pleistocene mammoths of Northern Eurasia used to experience chronic mineral hunger. As a result they became extinct due to geochemical stress arising on a background of deep abiotic changes in ecosystems. Most likely they were receiving not enough of essential chemical elements. This hypothesis was developed by TSU paleontologists and based on a large-scale, 15-years long research. Detailed information you can find in an article of Sergei Leshchinsky, Head of Laboratory of Mesozoic and Cenozoic continental ecosystems, TSU Faculty of Geology and Geography. This article was published in Archaeological and Anthropological Sciences. This image shows a fragment of the calf scull. Researchers around the world try to find out causes of extinction of the most prominent representatives of late Pleistocene megafauna - the mammoths. There are two main versions: 1) changes in microclimate and anthropogenic pressure, and possibly simultaneous effect of both factors. There are other much less popular theories of their extinction: 1) infectious diseases or 2) fall of celestial bodies. However, hardly anybody has paid attention to geochemical changes of environment where Mammuthus primigenius lived. Investigating remains of late mammoths, we frequently find obvious signs of skeletal diseases such as: osteoporosis, osteofibrosis, osteomalacia (softening and bending of bones), arthrosis, and other joint diseases - says Sergei Leshchinsky. He also underlines that articular surface of extremity bones of some individuals are not only harmed but damaged and mutilated by these diseases. As for osteoporosis, in separate collections we found it in 90% of cases. These diseases resulted in high traumatism of the animals; they got sprains and fractures even at very low loads. Mammoths with broken limbs or spine could not take food in sufficient quantities and could not follow herd. Such individuals died soon hunted by predators. As a result - the nature was stronger than the giant animals, and mammoths became instinct. From 2003 to 2013 Sergey Leshchinskiy analyzed over 23,500 bones and teeth of mammoths of Northern Eurasia to identify the symptoms of enzootic diseases. The destructive changes were revealed with the help of a magnifying glass (×10), in polished sections and histological sections under a stereomicroscope (magnification upto200×) and a scanning electron microscope (magnification upto10,000×), as well as by roentgenoscopy and densitometry. We investigated mammoth bones and teeth, discovered in beast solonetzs lacustrine-alluvial localities of Russia, Poland and the Czech Republic. The beast solonetz is the Russian term for a ground surface area characterized by a high content of certain macro- and microelements; as such it has a broader interpretation than "salt lick", "mineral lick" and "mineral source". Within the confines of the beast solonetz, animals eat soil and rocks and drink mineralized water from springs to maintain homeostasis, which is equivalent to the definition of "lithophagy". Most of chemical elements are vital necessary for animals to retain health condition of skeleton, muscles, skin, hear, and others. Part of animals is doomed if they fail to satisfy a mineral starvation in time. Lithophagy or geophagy practiced by primates is a com¬mon phenomenon in modern animal life; there is no doubt, therefore, that the mammoth was the largest of all lithophages in the Late Pleistocene of Northern Eurasia. This assertion is also confirmed by the frequent availability of mineral sub¬stances in the gastro-intestinal tract of mammoth carcasses and their coprolites, sometimes reaching 90% of their mass. At the highest moment of mineral starvation they became some kind of activity hotbed of mammoths and other large mammals. The particular vulnerability of mammoth in mineral starvation can be reflected in specific mammoth "cemeteries" of the late Pleistocene. TSU researchers found mass destructive changes in mammoth bones and teeth up to 70% or more of total number of remains in different collection. In most cases different destructions accompany one another which may indirectly show the same reasons of such consequences. In collection of some excavation areas (Krasnoyarskaya Kurya, Kraków Spadzista Street) probably the most common disease is osteoporosis. We can see rarefaction in all age groups including infant mammoths what means that disease development began in prenatal period since females suffered from mineral starvation. Above all since bone resorption in osteoporosis may be mild marked outwardly; it means that real proportion of remains with signs of osteodystrophy is likely to be higher than can be detected at a superficial examination. Why did mammoths and other large herbivores with large skeleton experience strong geochemical stress of Pleistocene? At that time there was a considerable expansion of acidic and acidic-gley geochemical landscapes, resulting in a drastic deficiency of Ca, Mg, Na, P, I, Co, Cu, Se, Zn and other vital chemical elements. The change in habitat is closely associated with the drastic replacement of favourable Ca-Mg-Na landscapes with acidic and acidic-gley ones. The latter reached its maximum range by the end of the Pleistocene, and are still the predominant landscape in most of Northern Eurasia today. This transition can be explained by the general neotectonic lift, which was subsequently followed (17-10 ka BP) by changes in the macroclimate, which became more humid and warmer. As a result, coastal lowlands were flooded and central areas were swamped (degrading permafrost being one of the reasons). The soils of the high plains and foothills were heavily leached due to a lowering of the ground water levels and increased precipitations. In this situation only rare beast solonetz could have served as geochemical oases where the large herbivores could satisfy their mineral hunger. However, by the early Holocene there may have been an insufficient number of these oases to support the viability of isolated mammoth populations. A similar abiotic scenario may be drawn for North America, where mammoths went extinct at the same time. Mammoth body size decrease and massive destructive changes in their bones and teeth indicate negative impact of the abiotic environment. Osteoporosis, osteomalacia, diseases of the joints indicate a metabolic disorder of alimentary nature. The analysis of the clinical picture of the diseases deserves special attention -how rapidly did the disturbances in homeostasis and the formation of osteodystrophy occur in unfavourable geochemical conditions? Based on this study, it appears that the destructive changes developed rapidly: extensive bone pathologies such as those found in the Taymyrskiy mammoth or in the Shestakovo-Kochegur, Berelyokh, Lugovskoe and Krakow Spadzista Street mammoth populations are incompatible with along developmental period. Under conditions of smaller and fewer geochemical oases and predominantly snow or acidic swampy-ground waters as drinking water in the winter, the "later" mammoths may have suffered from chronic mineral deficiency for 6- 10 months a year. It is highly probable that this severe natural condition lasted for more than 15 thousand years and may have proven fatal for the largest representative of the terrestrial fauna at high latitudes, - Sergey Leshchinskiy said. - The wool lyrhinoceros and cave bear may have suffered the same fate. Other large herbivores (bisons, horses and deer) have overcome the Holocene border, perhaps due to their greater mobility, although with a significant reduction of habitat and population size. Large cats and hyenas went extinct probably because of drastic reduction of nutritional resources at the time of the disintegration of the single "mammoth" ecosystem. The very high percentage of skeleton pathologies suggests a high murrain among mammoths, irrespective of anthropogenic impact, which could not lead to this species extermination throughout its huge territory. Man was a witness and one of the participants in the natural process of the Pleistocene megafauna's extinction. The extinction of large herbivores such as mammoths could explain massive prehistoric changes in vegetation and landscape structure. But it has wider implications, explaining more frequent fires in modern-day ecosystems for instance. Modern and paleo-ecologists joined forces in an international study led by the Netherlands Institute of Ecology (NIOO-KNAW). The results are being published online by PNAS this week. A British Pleistocene landscape during an interglacial with cave lion (Panthera spelaea), straight-tusked elephants (Palaeoloxodon antiquus), narrow-nosed rhinoceros (Stephanorhinus hemitoechus), steppe bison (Bison priscus), aurochs (Bison primigenius) and hippopotamus (Hippopotamus amphibius). The integrative study by modern and paleo-ecologists reveals that large herbivores are major engineers of 'landscape openness'. Present-day large herbivores substantially open up otherwise wooded landscapes. This sheds new light on the consequences of the extinction of the very large herbivores that roamed the earth during the Pleistocene. Think of mammoths, ground sloths, diprotodons, and many others. Using new techniques, paleo-ecologists have found evidence that shrubs and trees became more abundant following the Late Pleistocene extinctions, and that there were major shifts in plant species composition. Lead author Liesbeth Bakker from the Netherlands Institute of Ecology explains: "Large herbivores are not merely victims of the circumstances they live in, but actively engineer their environment. This has major consequences for other species, and for the structure of the entire landscape." The research team from Europe, the United States and Australia stresses that most research has focused on the causes of the Late Pleistocene large herbivore extinctions. The observed vegetation changes at the end of the Pleistocene were generally attributed to climate change. Until now. 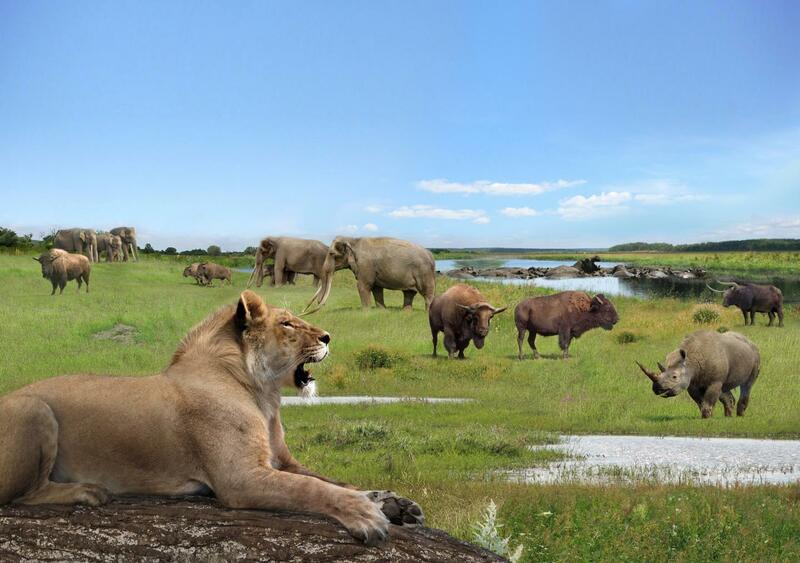 "Acknowledging the major ecosystem-engineering role of large herbivores, you can't imagine that vegetation stayed the same regardless of their presence or absence in the Late Pleistocene," says Bakker. Instead, the team proposes to predict the openness of the landscape based on the diversity of the herbivore community and on the actual animal densities. Modern techniques allow application of this framework for a better understanding of events at the end of the Pleistocene. The role of large herbivores even has implications for present-day ecosystem functions, An 'underbrowsed' landscape -that is, without large herbivores - leads to increased fire incidences: a phenomenon also observed after the Late Pleistocene extinctions. Furthermore, current conservation practices have to deal with another decline of native large herbivores, resulting in more wooded landscapes. Or with the opposite case of locally high densities of herbivores, such as deer, that lead to increased landscape openness. The present study facilitates a better prediction of both cases. A team of scientists, including seven from the University of New Hampshire, present findings from six years of direct observations made by NASA’s Interstellar Boundary Explorer (IBEX) mission of the interstellar wind that blows through our solar system in 14 papers published today in an Astrophysical Journal Supplement (ApJS) Special Issue. Launched Oct. 19, 2008, IBEX has now consolidated and refined the physical conditions of the material that surrounds our solar system—the interstellar medium—and has opened a new and unique view into the interface just outside our solar system’s boundary. This image shows a sky map of neutral oxygen atoms represented by the variously colored pixels coming towards (foreground) the IBEX spacecraft from the boundary of our solar system. The most intense feature, like a spotlight in the sky, is in red and shows interstellar oxygen wind coming towards IBEX, with the second wind component highlighted by the dashed yellow ellipse. The white dot indicates the direction in which Voyager 1 is heading away from the foreground. Voyager 1 currently traverses the layer of the heliosphere from which the second wind component originates. Image adapted from a figure in the ApJS paper authored by UNH graduate student Jeewoo Park. Among other things, this is important because this is the region where the giant bubble emanating from the sun—the heliosphere—begins to protect our solar system from the hazards of interstellar space, particularly high-energy cosmic radiation. “We need to understand our heliosphere because it is our first shield against high-energy galactic cosmic rays and thus plays a big role in making our solar system habitable,” says Eberhard Möbius, lead author on one of the ApJS papers and professor of physics at the UNH Institute for the Study of Earth, Oceans, and Space (EOS) and department of physics. Using energetic neutral atoms (instead of photons of light) to create maps of the boundary between our solar system and the rest of our galaxy, the yard-wide, half-a-yard-tall octagonal IBEX satellite is able to make high-fidelity measurements that determine the direction, speed and temperature of the interstellar wind and probe the pristine environment around our solar system as never before. IBEX discovered that the interstellar wind has a higher temperature than reported previously from observations with the Ulysses spacecraft. Together with the wind speed and density and the interstellar magnetic field, the temperature determines the pressure that the interstellar material exerts on the heliosphere. The size of the heliosphere, which is controlled by that pressure, and the interaction with the solar wind determine the effectiveness of this shield. IBEX has also detected for the first time a second wind component from the outer boundary region where the Voyager 1 spacecraft currently traverses. This component is an important telltale sign for the heliosphere’s deformation by the surrounding magnetic field, which also influences how the heliosphere serves as a protective bubble. IBEX is uniquely equipped to sample this region just outside the heliospheric boundary because it can distinguish individual species of the interstellar wind. It has detected the second wind component for helium and oxygen. The ApJS papers represent a broad collaboration between UNH, the Polish Academy of Sciences, Southwest Research Institute, the University of Bern, and other institutions. They compare the results from two major analysis approaches led by IBEX groups in New Hampshire and Warsaw. Scientists and engineers at the UNH Space Science Center designed and built major portions of the two ultra-high sensitivity cameras on board IBEX, including the "time-of-flight" mass spectrometer that can identify specific species of energetic neutral atoms, the iris or "collimator" of the specialized cameras, and the star sensor that allows very high precision direction finding of the interstellar wind. Additional UNH authors of the 14 ApJS papers include professors Harald Kucharek, Martin Lee, Nathan Schwadron, graduate students Trevor Leonard and Jeewoo Park, and research engineer David Heirtzler. Five of the 14 papers are led by UNH scientists: Kucharek, Lee, Möbius, Park, and Schwadron. IBEX is one in NASA's series of low-cost, rapidly developed Small Explorers space missions. Southwest Research Institute (SwRI) in San Antonio, Texas leads and developed the mission with a team of national and international partners. NASA's Goddard Space Flight Center in Greenbelt, Md., manages the Explorers Program for NASA's Science Mission Directorate in Washington. In a study published today in the Astrophysical Journal Letters, scientists from the University of New Hampshire and colleagues answer the question of why NASA's Voyager 1, when it became the first probe to enter interstellar space in mid-2012, observed a magnetic field that was inconsistent with that derived from other spacecraft observations. Voyager 1 sent back several different indications that it had punched through the edge of our sun's massive protective bubble inflated by solar wind--the heliosphere--after a 35-year journey. But the magnetic field data gathered by the spacecraft was not what scientists had expected to see. The UNH-led study resolves the inconsistencies. Upon exiting the heliopause, the local measurements of the magnetic field by Voyager 1, shown here as a compass needle, differed by 40 degrees from the "true magnetic north" estimated to be the direction of the magnetic field in the pristine interstellar medium. As the spacecraft pushed into interstellar space, the compass needle moved ever closer to true magnetic north. The view in the bottom image is from the starboard side of the heliosphere with the path of Voyager 1 in the plane of the page. Image by Kristi Donahue, UNH-EOS. "There are still naysayers out there regarding Voyager 1 crossing through the heliopause--the edge of the heliosphere," says astrophysicist Nathan Schwadron of the UNH Institute for the Study of Earth, Oceans, and Space and department of physics and lead author of the paper. "And the reason for this doubt is that when the spacecraft supposedly broke through the heliopause we should have seen some sort of distinctive shift in the magnetic field from one medium to the other," Schwadron says. Adding to the mystery, researchers found that the magnetic field direction observed in local interstellar space deviated by an angle of more than 40 degrees from what was expected. Some scientists posited that this deviation was an indication of Voyager 1 still being embedded in the solar wind inside the heliopause. University of New Hampshire astrophysicist Nathan Schwadron discusses the recent discovery about Voyager 1. Schwadron and colleagues solved the discrepancies using triangulation of four different datasets gathered by other spacecraft, including the Interstellar Boundary Explorer (IBEX) mission that in 2009 discovered a mysterious "ribbon" of energy and particles believed to be associated with the interstellar magnetic field. The scientists discovered that Voyager 1--like an orienteer through the outer solar system--measures the magnetic field moving the needle on a compass with cardinal directions provided by the IBEX ribbon. The ribbon center is the direction of "true magnetic north" for the pristine interstellar magnetic field. The study shows that the initial direction of the magnetic field observed by Voyager 1 is deflected by the heliopause, like an elastic cord wrapped around a beach ball. Therefore, the spacecraft is moving through a special region of space where magnetic fields are rotated away from true magnetic north. This means that while Voyager 1 did cross the heliopause in 2012, it is still traveling through this "muddied" magnetic field region and won't reach the "pristine" region of interstellar space until at least 2025. Notes Schwadron, who serves as the lead scientist for the IBEX Science Operations Center at UNH, "Our analysis confirms two things for the first time: that the center of the IBEX ribbon is the direction of the interstellar magnetic field and, secondly, that Voyager 1 is now beyond the heliopause." With the recent discovery, scientists now know they'll need to wait at least another decade before Voyager enters the region of interstellar space that is beyond the reach of the sun. Since the dawn of the space age, humankind has never passed through and explored this far-flung, pristine environment. "What's the nature of the galactic environment in terms of cosmic rays and magnetic fields?" Schwadron says. "We are beginning to paint a picture of what our local interstellar environment is really like and we can tie that to what's happening in a much broader environment within the galaxy. When Voyager 1 crosses that next boundary we will be poised to probe many longstanding mysteries." Observations led by astronomers at the University of Leeds have shown for the first time that a massive star, 25 times the mass of the Sun, is forming in a similar way to low-mass stars. The discovery, made using a new state-of-the-art telescope called the Atacama Large Millimeter/submillimeter Array (ALMA), which is based in Chile, South America, is published online today by the Astrophysical Journal Letters. 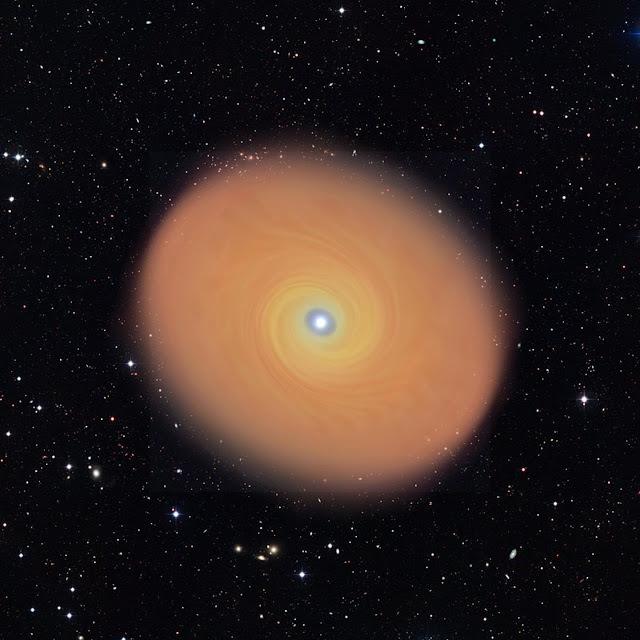 An artist's impression of the disk around the forming high-mass star AFGL 4176. The disk is 50 times larger than the size of Pluto's orbit, but it rotates around its star in a similar way to disks around forming low-mass stars. Lead author Dr Katharine Johnston, from the School of Physics and Astronomy at the University of Leeds, said: "Our groundbreaking observations show that not only does this still-forming massive star feed from a disk of material that surrounds it, like young Sun-like stars do, but it also mirrors low-mass star formation in the way the disk spins around the star. "Without a disk to channel material onto the forming star in a thin and dense layer, energetic processes, such as stellar winds from these hot stars, would halt the material before it could reach the star. It's like when the wind stops you in your tracks on a windy day." The research is one of the final pieces of the puzzle in understanding the lifetimes of the most massive and luminous stars, called O-type stars. These stars are major contributors to heavy element production in the Universe, such as iron and gold, which they eject into space in dramatic supernovae explosions at the end of their lives. Bit by bit, evidence for massive stars forming in a similar way to low-mass stars has been growing. However, until now, rotating disks that look exactly like the ones around low-mass stars were only seen around B-type stars, which are less than 18 times the mass of the Sun. Above a stellar mass of 18 solar masses, disks that looked like those around low-mass stars have been elusive. For those stars, astronomers often instead observed fluffy rotating structures that were hundreds of times bigger than low-mass disks and looked like gigantic rotating doughnuts rather than disks. "We started to think that real disks may not actually exist around the most massive forming stars, and that those stars might have to form in a different way," said Dr Johnston. "Maybe the accretion into an O-type star was much more chaotic and dynamic than for the birth of our Sun. "But our group took ALMA observations which show exactly what we were searching for all this time. We found a disk around an O-type star, which looks very similar to the disk that we think went on to form our Sun and the rest of the Solar System, except a gigantic scaled-up version of it. The disk we have found is at least 10 times larger and 100 times more massive than the disks that we usually see around young stars." The discovery was a long time coming as massive stars form much more quickly than low mass stars, making it harder to catch one in its nascent years. Massive stars are also less abundant than low-mass stars, so you need to look much further into space for one. For instance Orion, our nearest massive star formation region, is almost ten times further away than the nearest observation of a young low-mass star with a disk still around it. Professor Melvin Hoare, also from the University's School of Physics and Astronomy and a co-author of the study, said: "We needed better telescopes to resolve and peer further into the envelopes of gas that surround massive stars while they are forming. We needed a revolutionary telescope like ALMA. "We now want to apply for more observing time with the ALMA telescope, this time with even better resolution, to see whether the disk is smooth or fragmenting into pieces that might form other stars or even planets." Citation: "A Keplerian-like disk around the forming O-type star AFGL 4176", is published by the the Astrophysical Journal Letters on 29 October 2015. Dark matter: The world’s brightest physicists know it’s there, but can’t say for sure what it is. It is invisible, mysterious, and to most people — irrelevant to everyday life. But what if it could reach out and touch us? What if it already has, and so deeply that it just might be responsible for putting us here? One Harvard physicist is exploring that idea, and pondering the possibility that dark matter may have triggered the most famous cosmic collision ever — the one that did in the dinosaurs and opened the way for mammals to take their place. 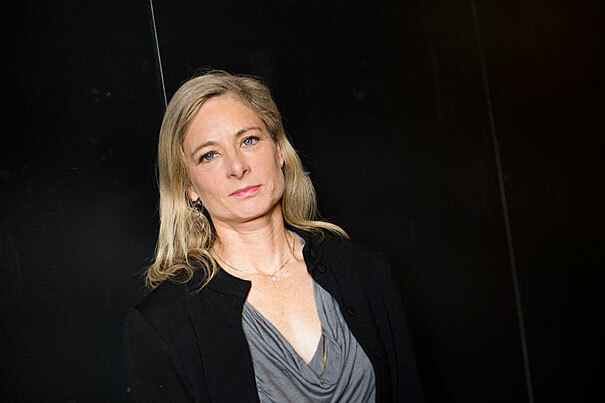 Theoretical physicist Lisa Randall, the Frank B. Baird Jr. Professor of Science, sees intriguing lines of evidence that tie dark matter to comets in the solar system’s distant Oort cloud, and from there to the 66-million-year-old impact crater on Mexico’s Yucatán coast. The book, to be published Oct. 27, takes the reader on a tour of the universe, from the Big Bang to today, from the story of life to mass extinctions, from the distant galactic disk to Earth’s K-T boundary layer — a thin, globe-spanning blanket of dust that scientists believe is evidence of the cataclysmic impact that ended the dinosaurs’ reign. The book suggests that a thin disk of dark matter could have influenced weakly bound comets in the outer regions of the solar system as it revolved around the center of the Milky Way, and may have been the ultimate cause of the impact. Randall admits that the disk hasn’t been found, but said that current data allows for it, and that instruments that might detect it aren’t far off. Randall makes liberal use of anecdotes and analogies to explain complex scientific ideas. We learn something about Randall, too: She skis, has a robot that vacuums her floors, and was once taken not for a cosmologist — one who studies the universe’s broad structure — but a cosmetologist. These four panels show the location of trans-Neptunian object 90377 Sedna, which lies in the farthest reaches of the Solar System. Each panel, moving clockwise from the upper left, successively zooms out to place Sedna in context. The first panel shows the orbits of the inner planets and Jupiter; and the asteroid belt. In the second panel, Sedna is shown well outside the orbits of Neptune and the Kuiper belt objects. Sedna's full orbit is illustrated in the third panel along with the object's location in 2004, nearing its closest approach to the Sun. The final panel zooms out much farther, showing that even this large elliptical orbit falls inside what was previously thought to be the inner edge of the spherical Oort cloud: a distribution of cold, icy bodies lying at the limits of the Sun's gravitational pull. Sedna's presence suggests that the previously speculated inner disk on the ecliptic does exist. The dinosaurs’ demise is a dramatic example of connectedness. Scientists are reasonably sure the killer made an enormous impact, though there’s some question whether it was from a rocky asteroid that would have originated within the solar system or a comet originating at its far fringe, in a vast assemblage of icy bodies called the Oort cloud, far beyond the orbit of Pluto. If the dinosaur killer was a comet, the next question is, what gave it the initial push toward Earth? Scientists confronting that question have an additional clue: The impact that caused the dinosaurs’ extinction wasn’t the only one in the planet’s history. There have been several, in fact, and there’s some evidence that they occur at regular — at least on a galactic scale — intervals of between 30 million and 35 million years. The Oort cloud is so far away and the time scales involved so vast that investigators have sought answers outside the solar system, which circles the galactic center every 240 million years or so, moving up and down through the flattened plane of the galaxy as it does. Some researchers have explored whether that passage could possibly bump a comet onto a collision course with Earth, but the band of visible matter in the galactic disk is diffuse enough that the collisions it would trigger don’t match the timing of those on Earth. While dark matter is invisible, it isn’t completely undetectable. All matter exerts a gravitational pull, and it is through dark matter’s gravitational effects on visible objects in the universe that scientists know it’s there. Unlike visible matter, however, dark matter isn’t concentrated in the galactic disk. It is thought to be spread in a sphere around the galactic center that extends well above and below the concentration of stars and other ordinary matter. Dark matter is invisible. Based on the effect of gravitational lensing, a ring of dark matter has been inferred in this image of a galaxy cluster (CL0024+17) and has been represented in blue. But what if, Randall asked, there were more than one kind of dark matter? After all, there are many kinds of visible matter, and there’s a lot more dark matter than visible matter. Scientists estimate that 85 percent of all matter in the universe is dark, so why should it all be one kind? If there is a dark particle that is able to emit energy, as ordinary matter does, it would cool and condense, naturally forming a rotating disk around the galactic center. The hypothesized size of dark-matter particles — about 100 times larger than a proton — would create a disk up to 100 times thinner and 20 times denser than one created by visible matter, thin enough that the collision timing would match. Randall, whose past work has dealt with concepts such as supersymmetry and extra dimensions, said that apart from research, educating the public about science is a high priority. Her three previous books were aimed at a general audience, and she’s worked in music, as well, writing the text for an opera based on her study of extra dimensions. To Randall, the story of the dinosaur impact — one of five known mass extinctions — resonates today in disturbing ways. This sixth extinction is a product of human activity. If readers of “Dark Matter and the Dinosaurs” take away nothing else, Randall said, she hopes they gain an understanding of just how interconnected elements of the universe can be, and how strongly humans are linked to non-human life on the planet. A busy kitchen is a place where all of the senses are on high alert—your brain is processing the sound of sizzling oil, the aroma of spices, the visual aesthetic of food arranged on a plate, the feel and taste of taking a bite. While these signals may seem distinct and independent, they actually interact and integrate together within the brain's network of sensory neurons. Researchers describe the “vOICe” technology and software behind the Shimojo laboratory’s efforts to assist the visually impaired to navigate known spaces using acoustic cues. Caltech researchers have now discovered that intrinsic neural connections—called crossmodal mappings—can be used by assistive devices to help the blind detect their environment without requiring intense concentration or hundreds of hours of training. This new multisensory perspective on such aids (called sensory substitution devices) could make tasks that were previously attention-consuming much easier, allowing nonsighted people to acquire a new sensory functionality similar to vision. The work is described in a paper published in the October 22 issue of the journal Scientific Reports. Depiction of the vOICe encoding scheme. A camera mounted on glasses records video that is converted to sound by a computer and transmitted to headphones in real time. "Many neuroscience textbooks really only devote a few pages to multisensory interaction," says Shinsuke Shimojo, the Gertrude Baltimore Professor of Experimental Psychology and principal investigator on the study. "But 99 percent of our daily life depends on multisensory—also called multimodal—processing." As an example, he says, if you are talking on the phone with someone you know very well, and they are crying, you will not just hear the sound but will visualize their face in tears. "This is an example of the way sensory causality is not unidirectional—vision can influence sound, and sound can influence vision." Shimojo and postdoctoral scholar Noelle Stiles have exploited these crossmodal mappings to stimulate the visual cortex with auditory signals that encode information about the environment. They explain that crossmodal mappings are ubiquitous; everyone already has them. Mappings include the intuitive matching of high pitch to elevated locations in space or the matching of noisy sounds with bright lights. Multimodal processing, like these mappings, may be the key to making sensory substitution devices more automatic. A Venn diagram of the vOICe encoding (blue) images to sounds, which are then reinterpreted from sounds (audition) to images (vision) in the human brain (red). 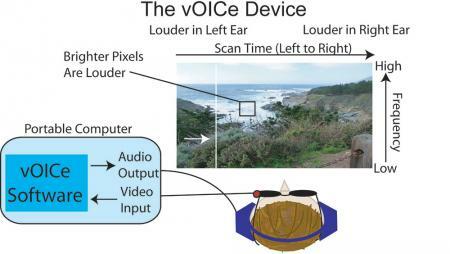 The researchers conducted trials with both sighted and blind people using a sensory substitution device, called a vOICe device, that translates images into sound. The vOICe device is made up of a small computer connected to a camera that is attached to darkened glasses, allowing it to "see" what a human eye would. A computer algorithm scans each camera image from left to right, and for every column of pixels, generates an associated sound with a frequency and volume that depends upon the vertical location and brightness of the pixels. A large number of bright pixels at the top of a column would translate into a loud, high-frequency sound, whereas a large number of lower dark pixels would be a quieter, lower-pitched sound. A blind person wearing this camera on a pair of glasses could then associate different sounds with features of their environment. 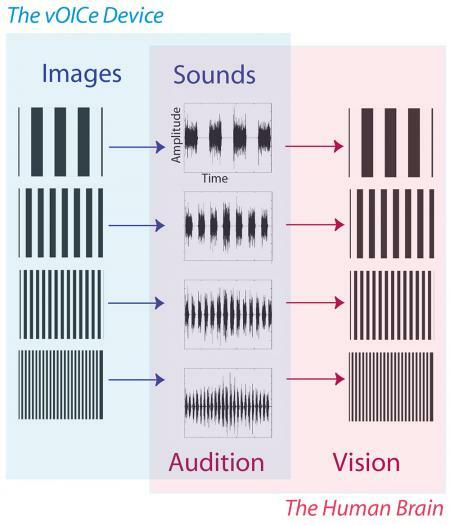 In the trials, sighted people with no training or instruction were asked to match images to sounds; while the blind subjects were asked to feel textures and match them to sound. Tactile textures can be related to visual textures (patterns) like a topographic map—bright regions of an image translate to high tactile height relative to a page, while dark regions are flatter. Both groups showed an intuitive ability to identify textures and images from their associated sounds. Surprisingly, the untrained (also called "naive") group's performance was significantly above chance, and not very different from the trained. The intuitively identified textures used in the experiments exploited the crossmodal mappings already within the vOICe encoding algorithm. "When we reverse the crossmodal mappings in the vOICe auditory-to-visual translation, the naive performance significantly decreased, showing that the mappings are important to the intuitive interpretation of the sound," explains Stiles. "We found that using this device to look at textures—patterns of light and dark—illustrated 'intuitive' neural connections between textures and sounds, implying that there is some preexisting crossmodality," says Shimojo. One common example of crossmodality is a condition called synesthesia, in which the activation of one sense leads to a different involuntary sensory experience, such as seeing a certain color when hearing a specific sound. "Now, we have discovered that crossmodal connections, preexisting in everyone, can be used to make sensory substitution intuitive with no instruction or training." The researchers do not exactly know yet what each sensory region of the brain is doing when processing these various signals, but they have a rough idea. "Auditory regions are activated upon hearing sound, as are the visual regions, which we think will process the sound for its spatial qualities and elements. The visual part of the brain, when processing images, maps objects to spatial location, fitting them together like a puzzle piece," Stiles says. To learn more about how the crossmodal processing happens in the brain, the group is currently using functional magnetic resonance imaging (fMRI) data to analyze the crossmodal neural network. These preexisting neural connections provide an important starting point for training visually impaired people to use devices that will help them see. A sighted person simply has to open their eyes, and the brain automatically processes images and information for seamless interaction with the environment. Current devices for the blind and visually impaired are not so automatic or intuitive to use, generally requiring a user's full concentration and attention to interpret information about the environment. The Shimojo lab's new finding on the role of multimodal processing and crossmodal mappings starts to address this issue. Beyond its practical implications, Shimojo says, the research raises an important philosophical question: What is seeing? "It seems like such an obvious question, but it gets complicated," says Shimojo. "Is seeing what happens when you open your eyes? No, because opening your eyes is not enough if the retina [the light-sensitive layer of tissue in the eye] is damaged. Is it when your visual cortex is activated? But our research has shown that the visual cortex can be activated by sound, indicating that we don't really need our eyes to see. It's very profound—we're trying to give blind people a visual experience through other senses." The paper is titled "Auditory Sensory Substitution Is Intuitive and Automatic with Texture Stimuli" and was funded by grants from the National Science Foundation, the Della Martin Fund for Discoveries in Mental Illness, and the Japan Science and Technology Agency, Core Research for Evolutional Science and Technology. 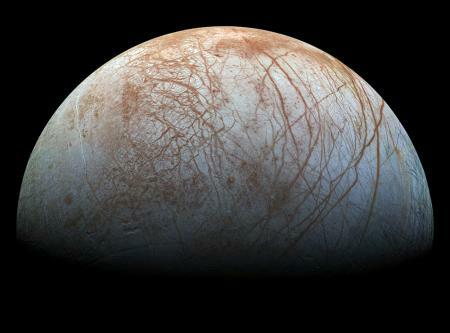 Jupiter's moon Europa is believed to possess a large salty ocean beneath its icy exterior, and that ocean, scientists say, has the potential to harbor life. Indeed, a mission recently suggested by NASA would visit the icy moon's surface to search for compounds that might be indicative of life. But where is the best place to look? The puzzling, fascinating surface of Jupiter's icy moon Europa looms large in images taken by NASA's Galileo spacecraft. 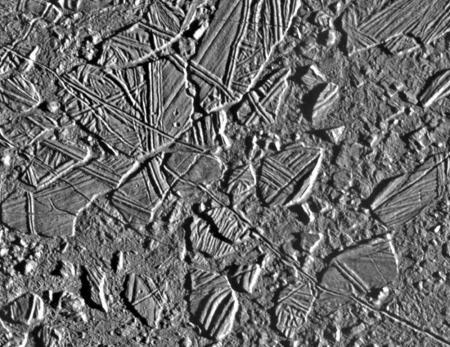 New research by Caltech graduate student Patrick Fischer; Mike Brown, the Richard and Barbara Rosenberg Professor and Professor of Planetary Astronomy; and Kevin Hand, an astrobiologist and planetary scientist at JPL, suggests that it might be within the scarred, jumbled areas that make up Europa's so-called "chaos terrain." "We have known for a long time that Europa's fresh icy surface, which is covered with cracks and ridges and transform faults, is the external signature of a vast internal salty ocean," Brown says. The areas of chaos terrain show signatures of vast ice plates that have broken apart, shifted position, and been refrozen. These regions are of particular interest, because water from the oceans below may have risen to the surface through the cracks and left deposits there. "Directly sampling Europa's ocean represents a major technological challenge and is likely far in the future," Fischer says. "But if we can sample deposits left behind in the chaos areas, it could reveal much about the composition and dynamics of the ocean below." That ocean is thought to be as deep as 100 kilometers. "This could tell us much about activity at the boundary of the rocky core and the ocean," Brown adds. Mapping the composition of the surface of Europa has shown that a few large areas have large concentrations of what are thought to be salts. These salts are systematically located in the recently resurfaced "chaos regions," which are outlined in black. One such region, named Western Powys Regio, has the highest concentration of these materials presumably derived from the internal ocean, and would make an ideal landing location for a Europa surface probe. In a search for such deposits, the researchers took a new look at data from observations made in 2011 at the W. M. Keck telescope in Hawaii using the OSIRIS spectrograph. Spectrographs break down light into its component parts and then measure their frequencies. Each chemical element has unique light-absorbing characteristics, called spectral or absorption bands. The spectral patterns resulting from light absorption at particular wavelengths can be used to identify the chemical composition of Europa's surface minerals by observing reflected sunlight. The OSIRIS instrument measures spectra in infrared wavelengths. "The minerals we expected to find on Europa have very distinct spectral fingerprints in infrared light," Fischer says. "Combine this with the extraordinary abilities of the adaptive optics in the Keck telescope, and you have a very powerful tool." Adaptive optics mechanisms reduce blurring caused by turbulence in the earth's atmosphere by measuring the image distortion of a bright star or laser and mechanically correcting it. 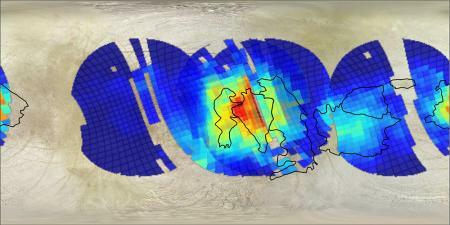 The OSIRIS observations produced spectra from 1600 individual spots on Europa's surface. To make sense of this collection of data, Fischer developed a new technique to sort and identify major groupings of spectral signatures. "Patrick developed a very clever new mathematical tool that allows you to take a collection of spectra and automatically, and with no preconceived human biases, classify them into a number of distinct spectra," Brown says. The software was then able to correlate these groups of readings with a surface map of Europa from NASA's Galileo mission, which mapped the Jovian moon beginning in the late 1990s. The resulting composite provided a visual guide to the composition of the regions the team was interested in. Three compositionally distinct categories of spectra emerged from the analysis. The first was water ice, which dominates Europa's surface. The second category includes chemicals formed when ionized sulfur and oxygen¬¬--thought to originate from volcanic activity on the neighboring moon Io¬¬--bombard the surface of Europa and react with the native ices. These findings were consistent with results of previous work done by Brown, Hand and others inidentifying Europa's surface chemistry. But the third grouping of chemical indicators was more puzzling. It did not match either set of ice or sulfur groupings, nor was it an easily identified set of salt minerals such as they might have expected from previous knowledge of Europa. Magnesium is thought to reside on the surface but has a weak spectral signature, and this third set of readings did not match that either. "In fact, it was not consistent with any of the salt materials previously associated with Europa," Brown says. When this third group was mapped to the surface, it overlaid the chaos terrain. "I was looking at the maps of the third grouping of spectra, and I noticed that it generally matched the chaos regions mapped with images from Galileo. It was a stunning moment," Fischer says. "The most important result of this research was understanding that these materials are native to Europa, because they are clearly related to areas with recent geological activity." The composition of the deposits is still unclear. "Unique identification has been difficult," Brown says. "We think we might be looking at salts left over after a large amount of ocean water flowed out onto the surface and then evaporated away. "He compares these regions to their earthly cousins. "They may be like the large salt flats in the desert regions of the world, in which the chemical composition of the salt reflects whatever materials were dissolved in the water before it evaporated." Similar deposits on Europa could provide a view into the oceans below, according to Brown. "If you had to suggest an area on Europa where ocean water had recently melted through and dumped its chemicals on the surface, this would be it. If we can someday sample and catalog the chemistry found there, we may learn something of what's happening on the ocean floor of Europa and maybe even find organic compounds, and that would be very exciting." Are Fish The Greatest Athletes On The Planet?